So if you're a long time blog reader you know that I rarely ever wear my hair straight, I curl it or blow it out 99% of the time, but when Remington reached out and asked me to try out their new PROtect Flat Iron, I thought I would appease my highschool self (was I the only one who flat ironed her hair every.single.day in Highschool?) and give it a go. I haven't been able to stop wearing it straight since it showed up on my doorstep! It takes half the time, and thanks to the innovative new micro-vapor technology, my style lasts twice as long. This little beauty will give you more reasons than warmer weather to look forward to the Spring. The special steam chamber releases a micro-vapor that infuses your hair with moisture and helps lock in that pretty style. I haven't seen frizz or even static since I began using it, its a miracle! Do you want to get your hands on your own Remington PROtect Flatiron? It launches March 1st in all Target & Walmart stores...get excited! For a demonstration on the flat iron as well as a quick tutorial for this cute dutch crown braid tune in to the video below! Ahh, so cute, absolutely love this! My hair is naturally straight, but it's really thick so I straighten it when I want a thinner feel! I love that! Something just feels so much more manageable with a straight hairstyle. Hope you're having a great week! Thanks, Anna! A braid is a catch-all for hairstyles for me. It looks like you put in effort but it's so quick and easy! You're one to talk, Em! Your gorgeous thick waves kill me! I love the braid! I wear my hair the same way all the time, so I am always look for ways to switch it up! When I do straighten my hair it tends to be super flat, so this braid would be a great way to avoid that. Yes, ma'am! And with a little tease on your crown you will have all sorts of va-va-voom! That braid is so cute! And now I totally want to try out that flat iron! Thank you, Ky! Best flatiron I have EVER used! I flat ironed my hair all the time in high school and now I almost never touch the thing. I love this look on you! 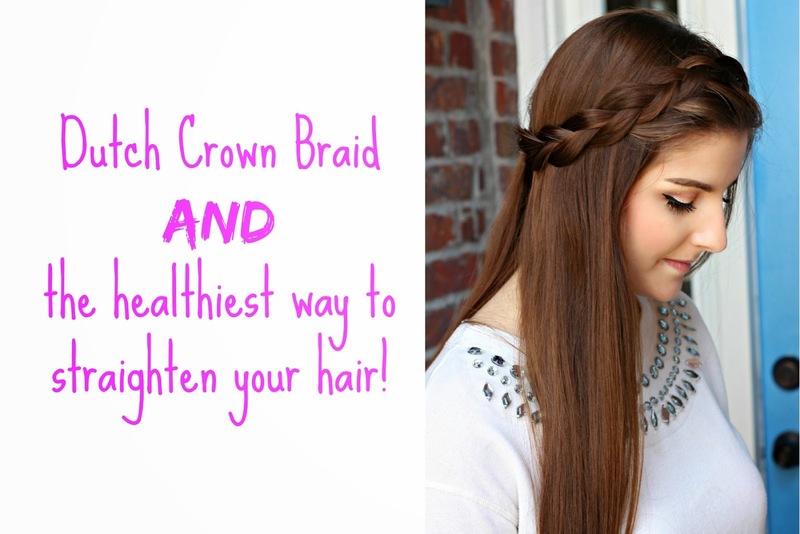 I love that braid and your hair looks so shiny and healthy! Thank you, Denise! Yes, me too! I hadn't used a flat iron in forever but i've totally fell in love with this one. Hope you're having a great week! You are SO sweet, Maria! Thank you. This is the first I have heard of that flat iron and it is definitely at the top of my shopping list now! So glad you posted this because I really need that! Its amazing! I've never used one so great! March 1st hustle to your local Walmart! You will love it! Best flatiron ever! Hope you're having a great week! I'm actually in the market for a new hair straightener. Mine is very old and is starting to smell every time I plug it in. I may have to hold out for march 1st. YES! It's the best. Mine is so old from HIGHSCHOOL! It's gross. I feel so spoiled every time I use this one! Thanks, Emily! You're so sweet.